Yea my black reference mods 510 doesn't sit flush neither but my original raw aluminium one did. So screwing that down further gave you less resistance? 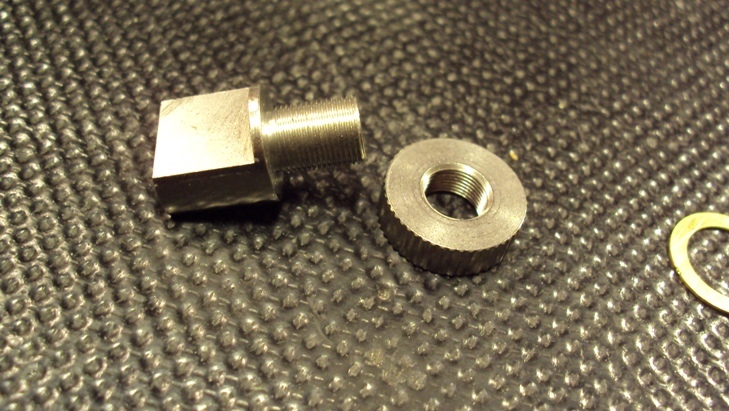 You will have to get a 1/2"x20 (1/2" UNF) thread tap and a pin wrench, adjustable with 4 mm pins. One very important thing is you have to either take the centre pin out buy removing the circlip or disconnect the positive out when trying to turn the Evolv 510 or you will twist that wire and could rip the positive wire off the board. I got 0.004 for my Realeaux with the soldered carto above, I have set it to 0.0036 IIRC Wismec have 0.003 in their config file. I received the copper 510 tool today. It is very well machined and works great. If it helps anyone else my Wismec Reuleaux read mod resistance of 0.005 ohms. Last year I bought the Fat Daddy Vapes 510 tool, about 1/4 way down on the page, right side --> http://www.fatdaddyvapes.com/shop.html Made of stainless, you get two of them for $5, I used them for checking my mods (as well as installing 510's), just take the jam nut off before checking the resistance to make sure you bottom out in the 510. 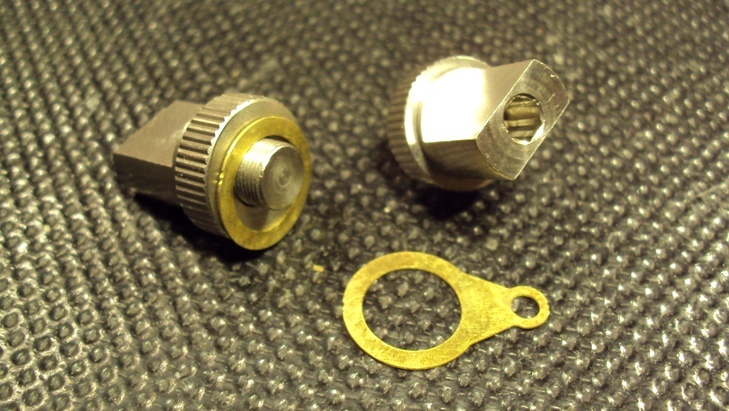 FYI, I use a copper washer between the lock down/jam nut and a 510 when installing 510's so I don't mar up a 510. 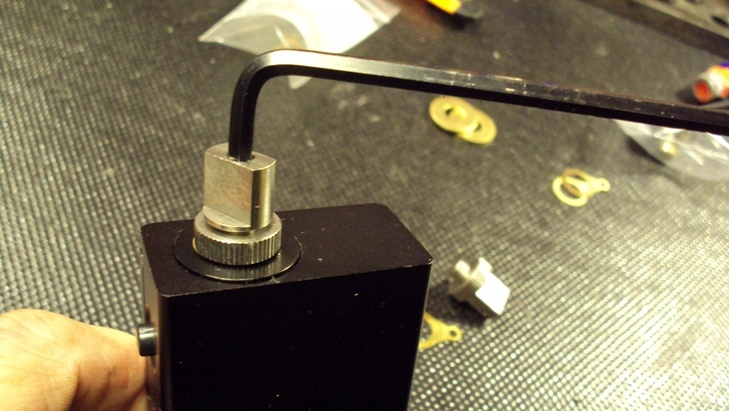 Also, they don't show in the pic, there is a hex machined in the top of the tool so you can use an allen wrench. I use them to install all my 510's including the Evolv's. 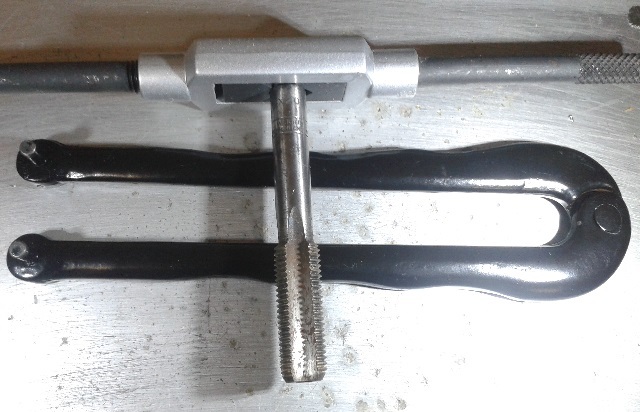 ETA: Here's some more pics of the tool. I have built loads of dna devices and i measure the mod resistance with a solid copper threaded knob from signature mods. and it reads the resistance as i screw it on like normal but when it makes good contact it shows? does this mean there is 0 resistance in the mod? I always make sure the threads on the tool and the 510 is good and clean of any juice, dirt or oil before testing. I confess, I'm obsessive with keeping the 510's and thread on the atty's clean, I use q-tips on the 510 every time I change an atty, cram them hard as I can in the 510 and rotate it all around and repeat. On the atty threads, fold a piece of paper towel doubled, with my thumbnail I press the towel hard into the threads and spin. Over time juice and crud will get in there and I'll get black steaks in the cotton from the 510 threads where the crud came out of the bottom of the treads. Usually I use dry q-tips, if a tip looks really dirty I'll dampen with alcohol then repeat with a dry tip.
? usually means it has hit the current limit for the test, so the res it at the low end of the range, I use 0.002 when I get this. Hey VB, Did I get that wrong? I thought it meant zero? Yes, ? means o ohms, you'll get the same ? when no atty is attached, the board sees zero/no ohms therefore shows the ? there should be no circuit when no atty attached. Yeah, it indicates that a reading was not be taken, IIRC it is probably a safety limit on current for the test being triggered when the resistance is extremely low. You can also see ? sometimes when there is nothing in the 510. EDIT: Deleted post as others had already responded so my response was duplicative. Bringing this back up hope nobody minds. Ive made a "dead short rda deck to test mod resistance. I used a Jaybo inde duo. 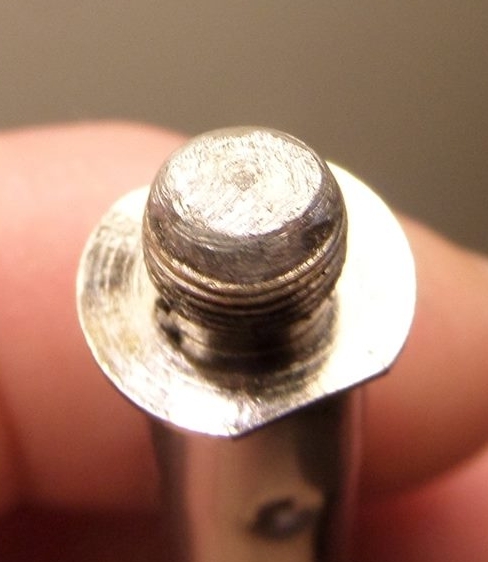 I removed the topside positive post to 510 screw insulator so the positive "T" post is screwed directly against the rda body. I also bent the both sides of the "T" downward so they are in direct contact with the negatives that of course are part of the deck body. Should be direct short for sure. Thing is on my ohm checker it reads 0.04ohm. should a dead short show any resistance to the meter? If that is normal is there anything I need to subtract from what atty analyzer reads? Im doing this to test on a vt250 (dna250) device it that makes any difference. Thanks in advance for any insight. Im a new join and just poking around the vast majority here knows way more than I do lol. 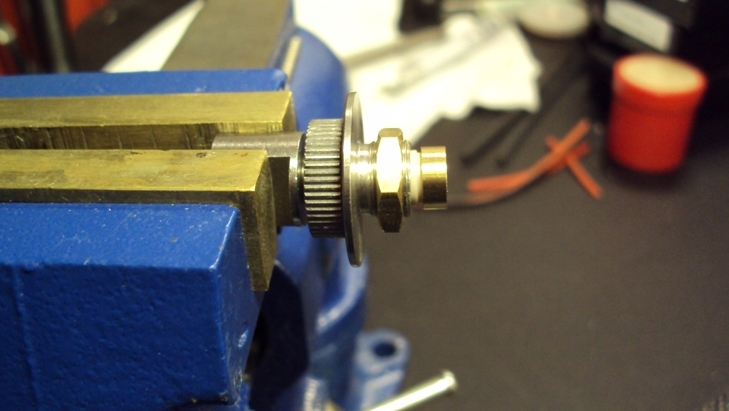 Early on I put heavy strand of copper through the posts of my Velocity, reading was 0.02 ohms. Using and old cartomizer or 510 adapter with it's end soldered together works well. Would shorting a premade tank coil (super tank mini) by gutting it and replacing the wire insulator with a metal tube that fits tightly an accepts the coils 510 post work? I mean taking that assembly and using the tanks base to connect to the mod 510. Would that get me a lower resistance short? Or does the impedance of the shorted "tool" not matter that much? With the inde duo deck deal i get very unstable reading while tightening it into the 510. Bottomed out I get ? (0) backed off just a hair I get a stable 0.008 in atomizer analyzer. But we want a bottomed out full connection right? With that I get zero but zero cant be right the mod has to have SOME resistance doesnt it? And if the zero reading is correct do I set the mod at 0 or is there a default figure to try? At zero from the factory TC is all over the place. Set to 0.008 coils read low and the vape is very weak. Thanks for the reply. Im learning here, kinda read it and try it. Basic understanding of impedance and its affect in power from working with speakers and amplifiers. 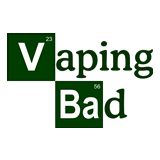 It would be nice to have stable consistent performance from my mod and a little less fiddling to get a nice Vape. Thanks again! Well here is what's going on, with all the 250 boards and all the 200 boards with 1.2 SP? 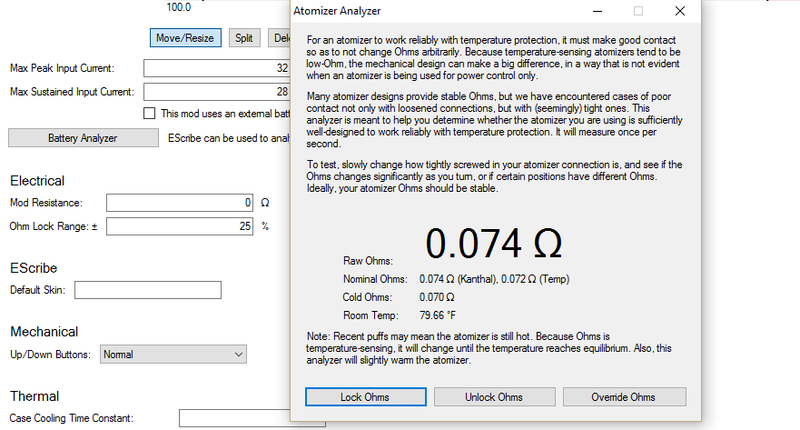 software Atomizer Analyzer will not read below 0.007 ohms. So if it displays down to .007 then throws up a "?" it's .007 ohms or less. On the earlier firmware it wouldn't read below 0.002 ohms. .... the inde duo deck deal i get very unstable reading while tightening it into the 510. Bottomed out I get ? (0) backed off just a hair I get a stable 0.008 in atomizer analyzer. But we want a bottomed out full connection right? With that I get zero but zero cant be right the mod has to have SOME resistance doesnt it? Yes, there has to be some resistance, and what you've decribed is perfectly normal. As dwcraig mentioned, AA has beeen busted for quite some time. ....And if the zero reading is correct do I set the mod at 0 or is there a default figure to try? At zero from the factory TC is all over the place. Set to 0.008 coils read low and the vape is very weak. A lower value, or zero, is better than a higher value for TC. Can you describe in more detail your TC issues, either in a new thread or an already existing thread so we can look at that independantly. 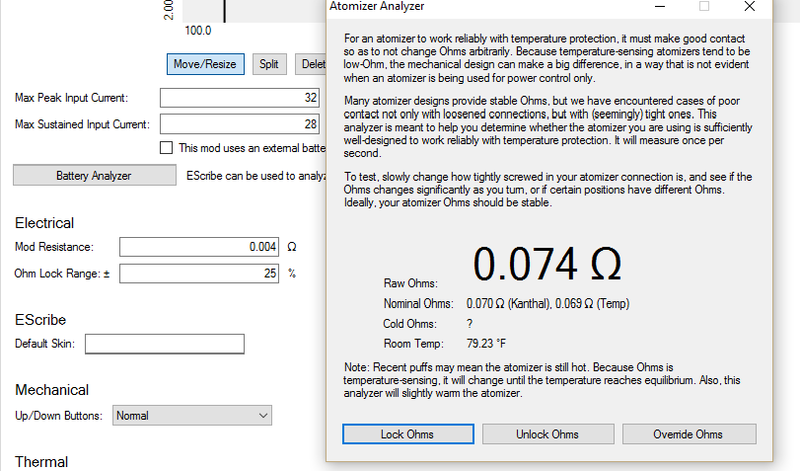 For quickest easiest troubleshooting, a screen capture of the profile, a description of the coil, and a screen capture of device monitor with Temperature settings at a minimum. Proper Print screen, not a skewed moire filled fuzzy picture appreciated. Just make sure that the coil is cold.. Hot damn @giz_60, you da man. I'm gonna do this myself on my new 250. So, just to be clear .... we have 3 values to work with .... 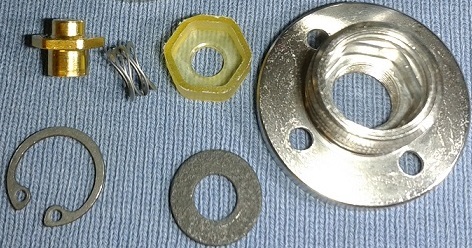 Raw Ohms, Nominal ohms (kanthal and Temp). And you're way was to set mod resistance to zero, then subtract 'raw ohms' from 'nominal ohms (kanthal).' So we really only have the atty resistance not accounted for. I wonder ... how does Evolv expect anyone to do this accurately now?